Everyone wants a taste of the American pickup truck lifestyle. From the moment, we knew it would be a sales success. By with the practicality of a pickup truck, Jeep has created the ideal vehicle for America. We can just imagine how many of these we will see cruising on the streets in the United States with the roof off covered in dirt from an off-road expedition. But what about Europe? and an all-American model like the Gladiator could give European market trucks like the Volkswagen Amarok and Mercedes X-Class some serious competition. , Jeep has decided to sell the Gladiator in Europe as soon as next year. "It will land in quarter one or quarter two in 2020,” said Jeff Hines, Jeep's European boss. "It won’t be big volumes, but our customers love the idea of it.” Jeep had enormous success in 2018 with 170,000 cars delivered in Europe, which is an increase of 50% compared to 2017 and enough to outsell Land Rover. Europeans are clearly enamored with the idea of living the American lifestyle behind the wheel of a Jeep. The brand's best-selling models in Europe, the Renegade and Compass, will both be built in Italy after 2020 once Compass production moves from Mexico. Both of these small SUVs will be sold as plug-in hybrids, which were revealed at the 2019 Geneva Motor Show. 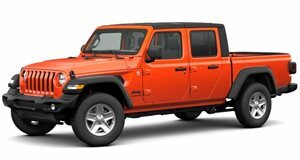 Jeep didn't say what engines would be offered in the Gladiator but we'd assume the 3.0-liter six-cylinder turbo diesel would be a given for the diesel-loving European market. Along with the Gladiator, Jeep will offer new ‘S range' models with a greater off-road focus. Hines says Jeep wants to continue expanding in presence in Europe. "How big can we be? Never big enough, so long as we stay true to the brand. To grow more than 50% will be tough, but we have plans to support growth even if the industry remains flat or decreases," he said.